Chicago’s data portal uses Socrata, which is a very well-documented and easy-to-use tool for exposing data. It has a wonderful API for querying and accessing data, but to keep things simple for this post we’re just going to download a CSV file. If you’re on the page for a dataset, you can download it by clicking on “Export” on the top right and then selecting “CSV”. To avoid all that, the direct link to download a CSV of this dataset is here. Download it and take a look at what we’ve got using your spreadsheet or text editor of choice (mine is Notepad++). Now for the magic – let’s load some data! The dbatools command that does all the heavy lifting here is called Import-DbaCsvToSql. It loads CSV files into a SQL Server table quickly and easily. As an added bonus, the entire import is within a transaction, so if an error occurs everything gets rolled back. I like to specify my tables and datatypes ahead of time, but if you want to load into a table that doesn’t exist yet, this script will create a table and do its best to guess the appropriate datatype. To use, simply point it at a CSV file and a SQL Server instance, database, and (optionally) a table. It will take care of the rest. The two parameters on the second line tell the command to truncate the table before loading, and that the first line of the CSV file contains column names. 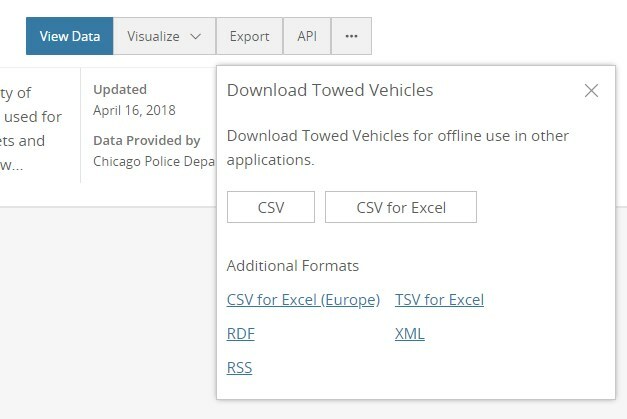 Now the data has been staged, but since this dataset contains all cars towed over the past 90 days, chances are very good that I already have some of these tows in my production table from a previous download. A simple query to insert all rows from staging into production that aren’t already there will do the trick. This query is run using another dbatools command, Invoke-Sqlcmd2. The ID column uniquely identifies each tow event, and the production table uses it as a primary key, however I have found that occasionally the dataset will contain duplicated rows. The ROW_NUMBER() window function addresses this issue and ensures each ID is attempted to be inserted only once. I’ve showed you how simple dbatools makes it to load a CSV file into a table and then run a query to load from staging into production, but the beauty of PowerShell is that it’s easy to do way more than that. I actually scripted this entire process, including downloading the data! You can download the full PowerShell script, along with a T-SQL Script for creating the tables, from my GitHub here. This post was cross-posted from Bob’s personal technical blog at bobpusateri.com.